Yesterday I counted how many squares I have left to knit…. 86! How could that be? Even on the chart it looks like I’m approaching the end! So I decided to count how many squares I’d already finished. I couldn’t believe I’d knitted 231 squares back in the fall and winter of 2002/2003. That’s a LOT of little mitred squares! I remember one of my knitting friends warning me that this project involved a LOT of knitting. Naturally, I took no heed and can barely remember the warning much less who warned me. I was happily knitting. Now that I’m back to it, I am slowly remembering lots of other things too. This was the fall that my older son went away to college. I missed him terribly, but there was a wonderful silver lining that I had not anticipated. My younger son and I suddenly had some uninterrupted time together. It was the year that he toured colleges, took his SATs, wrote his applications. We went on college visits together, and I brought along my knitting….this very project. It had not grown to the dimensions it is now which make it somewhat cumbersome for traveling. We visited schools in Pennsylvania, New York, and New England. We had that unexpected time to become closer. It was the last few months before he got his driver’s license so I was still his main companion in the car, and I was the one who accompanied him when he drove places with his learner’s permit, such as the physical therapist I mentioned earlier. It seems to me that everyone takes notice of the wonderful time you have with your firstborn, before there are siblings who require you to divide your attentions. Surely it’s a mother’s point of view to romanticize this special time with a firstborn that no other child gets. But I think the time I had alone with my younger 16 year old was equally precious….because he was aware of it too. We both enjoyed getting to know each other more deeply, and he had my complete attention while he navigated the rite of passage out into the world and determined who he wanted to become. It was a significant time of life for both of us, and I was moved to have time with Chris during this stage. And all through that period I was knitting the ‘Zig Zag.’ Chris graduated from high school over 10 years ago. He finished his undergraduate work in math and physics and is now in his 5th year of a doctoral program in physics. He has become the person he planned to be. He is almost finished writing his dissertation and will probably be out of academia in a few more weeks. There is a lot of life that has happened while this ruana lay in its project bag, buried in my studio in New Jersey, and then my new studio in Connecticut. 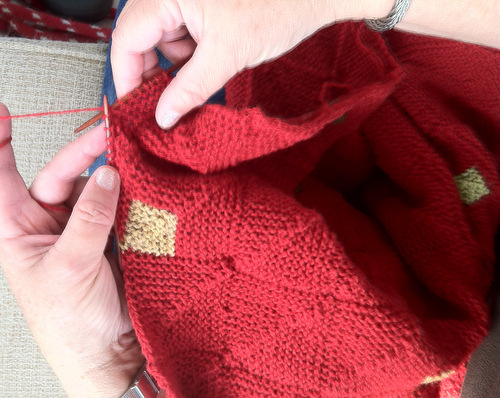 Such is the life of a knitting project….everything completes itself in its own time. This entry was posted in knitting, sailing. Bookmark the permalink. What a lovely story. How wonderful that a knitting project can hold so much.